Tired of staying at impersonal, expensive, noisy condos? Want to be treated more like family instead of just another renter? Our non-smoking unit is an unusual getaway for a couple (and maybe one small child). We live in the top two floors of a residential three story townhouse located directly on the Gulf of Mexico on Okaloosa Island and rent out our ground floor lock-out studio apartment from time to time. Our unit is not for everyone. If you want to party until the wee hours of the morning, there are plenty of other units available. But if you don't mind being fairly quiet from 10:00 PM until 6:00 AM, don't mind a small schnauzer-yorkie mix dog named Lottie, and enjoy just kicking back with a margarita and a little Jimmy Buffett music, this should suit you fine. Your dedicated parking place will be right in front of the building, just steps from the entrance. We have two bicycles for you to tour around the island, and you can borrow Dave's fishing gear to do a little surf fishing. Beach gear (chairs, towels, umbrella, boogie boards, fresbies, kids toys, etc.) is also provided. You will have a private deck with a bar, and an enclosed outside shower for rinsing off after a day at the beach (Yes, we have a full bath inside also). Finish off the evening with a game of darts, chess, or a boardgame, or select a movie from our DVD collection. When we bought our town home in 1998 it was a real 'fixer upper'. Dave spent two years remodeling the two upper levels where we now live, and then decided to build a studio apartment in the rear of the garage. We always wanted to own a Bed and Breakfast and we feel that our unit is the next best thing to it. We wanted a unique rental where our guests would feel at home and more like family, not just another impersonal condo. Since we opened for business in March 2004 we have been blessed with almost continuous bookings from March through October. Many of our guests come back year after year and we will never forget who actually pays our bills. Okaloosa Island is a little 'hidden gem' on the Emerald Coast. Quiet, laid back, very little traffic and beautiful beaches. And our Beachbums Hideaway is right on the beach! What more could you ask for? 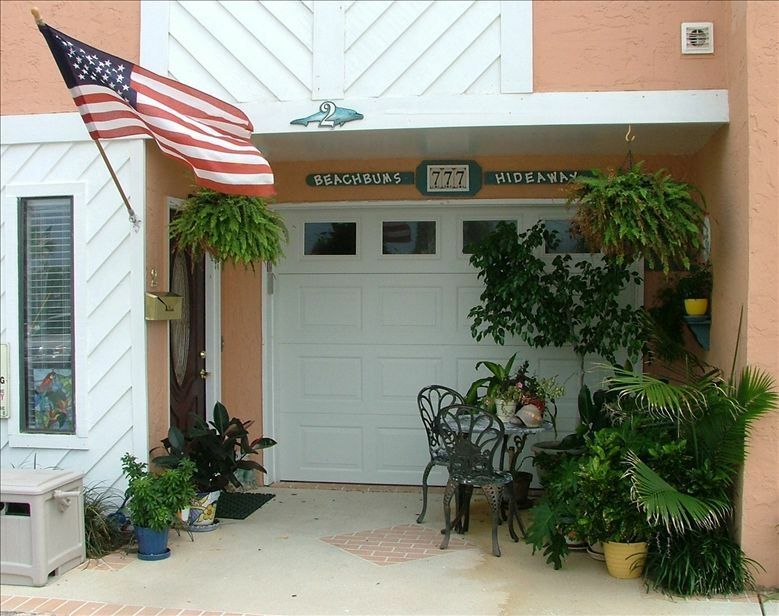 The Beachbums Hideaway is truly unique.....the only unit like it on Okaloosa Island. We provide everything you need.....towels, linens, beach umbrella, beach chairs, cooler, boogie boards, beach towels, suntan lotion, etc. All you really need to bring are your personal items, food, and drinks. We provide everything else. Toilet, 4' shower, and vanity with sink and mirror. We have dunes between our back yard and the beach, so there is a partial view of the Gulf of Mexico. Our unit is directly on the beach on Okaloosa Island. Your dedicated parking spot is right in front of the garage. Secure WiFi. Code is posted in unit. A good size refrigerator, but no automatic ice maker. We do not have a stove/oven or dishwasher. Other than that, our kitchen is nicely outfitted with a microwave, toaster/oven, electric skillet, crock pot, and blender. We have a 26" men's bike and 24" woman's bike available for your use. The residential area to the north of us is a wonderful area to ride the bikes. Closest to the beach you can get!!! Dave and Ginny are absolutely amazing! Very attentive and have given their little piece of paradise everything you could ever hope for in a beach house. They are kind enough to share all of their beach items; beach towels, beach chairs and an ice chest! They kitchen has a large refrigerator to store any food and drinks you may have. The bed is comfortable and it was so relaxing to stretch out the couch and cover up with a quilt. Dave and Ginny have went the extra mile to make sure your stay is one you’ll never forget!! Very clean and enjoyable, would stay again. Nice accommodations perfect for our little getaway. Wonderful stay!! Perfect little studio for my husband & I. We wanted a place steps from the beach that was quiet & relaxing — that’s exactly what we got! This little Beachbum studio apartment has so much character & is so inviting. The owners, Dave & Ginny, put a lot of thought into making it comfortable & unique. The beach & water were beautiful. We love to walk & run and there were safe neighborhoods & sidewalks on the main road, which was a bonus. We will definitely be back! What an amazing piece of paradise Dave and Ginny share. They have thought of the smallest details to accommodate travelers. They provide so many things. I must state their towels and linens are better than home lol!!!! I will be sharing with family and friends this wonderful paradise we found. The Gulfarium (a smaller version of Sea World) is about two miles away. Also, The Boardwalk with shops and restaurants is located next to the Gulfarium and is only 2 miles away. A 1/4 mile long fishing pier is located at the Boardwalk also.